When I discussed how some corrupt health mailboxes came about following my flattening of an Exchange 2013 server, I called them “zombie mailboxes”, which might have seemed unkind to some. In fact, it’s an accurate reporting of the fact that the Exchange Health Manager service will faithfully recreate two health mailboxes per mailbox database if it finds them missing. A Managed Availability probe cannot be deprived of its mailbox, after all. You could have hours of harmless fun dealing health mailboxes and waiting for the Health Manager service to notice and recreate them, but this is probably not a very good use of your time and is certainly not a productive activity. Unless, of course, you need to be busy when a manager looks for you to do something which you’d really prefer to avoid, in which case declining on the basis that you have to “recreate some health mailboxes to keep Managed Availability working” is just the sort of excuse that comes in handy. By now you might be convinced that I am super-sharp to notice that health mailboxes were corrupt. Alas, this couldn’t be further from the truth as I was blissfully unaware that anything was amiss until I noticed some device quarantine notifications show up in my mailbox. 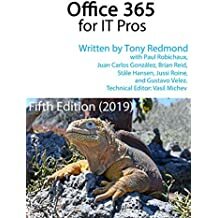 These notifications are created by Exchange ActiveSync (EAS) after you establish a mobile device access rule (otherwise known as an ABQ rule for “allow, block, or quarantine”) that quarantines unknown devices when an attempt is made to connect them to a mailbox. Exchange 2010 and Exchange 2013 support ABQ rules. Managed Availability uses the health mailboxes to create synthetic transactions. One message category verifies that EAS is working properly by connecting to the health mailboxes to emulate an EAS transaction from a mobile device type called “EASProbeDeviceType”. The quarantine message (shown below) also tells us what health mailbox was used. The health mailboxes were recreated a short period after I removed the corrupt mailboxes. Managed Availability then attempted to use the new mailboxes for the EAS synthetic transactions. The new mailboxes were unknown to EAS and were not covered by any existing ABQ rule so their attempts to connect were intercepted and the devices quarantined. Of course, these aren’t real EAS clients and are not as important to deal with as would be messages about quarantined devices that belong to humans. On the other hand, it is important to allow Managed Availability to work as designed, so some action is necessary. The easiest solution is to create an ABQ rule that permits the probes to connect to the health mailboxes with EAS. This takes less than a minute of administrator time to fire up EAC, go to the mobile tab, and create the necessary rule (below). Afterwards EAS will recognize “EASProbeDeviceType” as a valid device type, much like it might recognize a Windows Phone 8 device or an iPhone. The good news is that you might not have to create a rule at all. 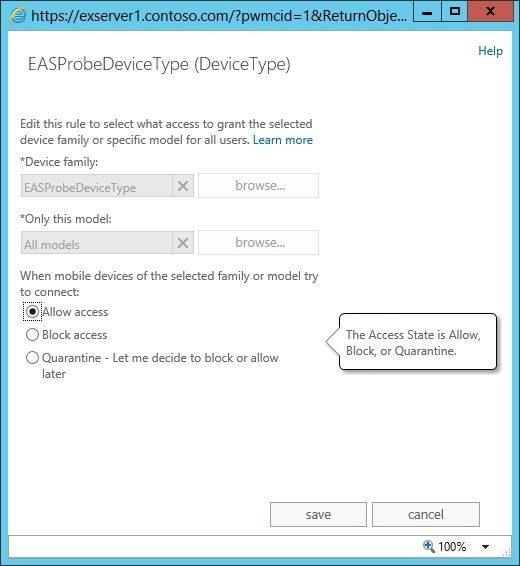 The default is to let any device connect to EAS and unless you made a decision to block selected devices you will probably discover that no ABQ rules are in place, which then means that the health mailboxes can connect as they wish. On the other hand, it’s entirely possible that you put some ABQ rules in place some time ago and have missed the quarantine messages about the EAS probes. But that would never happen, would it? 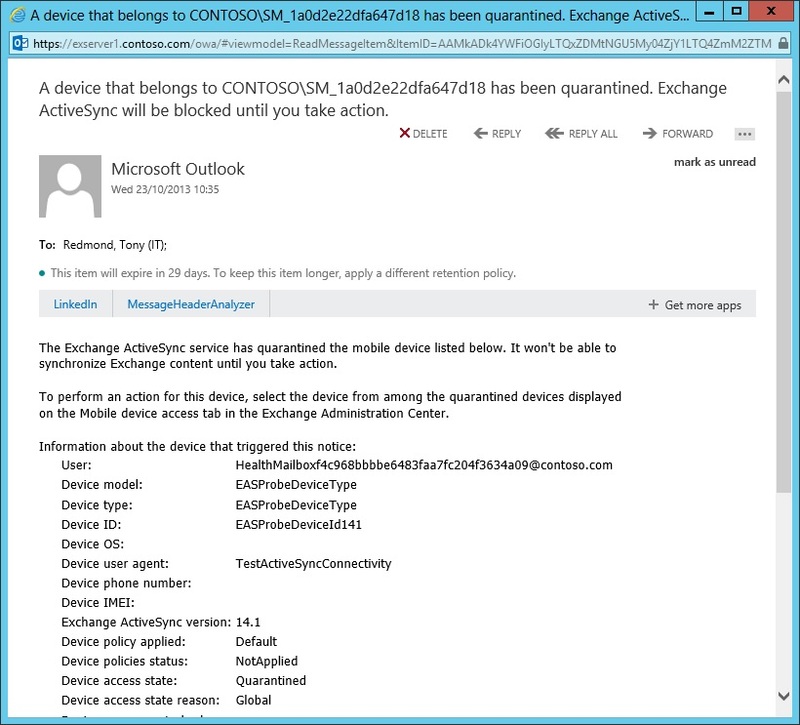 This entry was posted in Exchange 2013 and tagged ActiveSync, EAS, Exchange 2013, Health mailboxes, Probes. Bookmark the permalink. Tony, thanks for being a zombie hunter. Besides creating new health mailboxes it would be helpful, if the Exchange Health Manager Service would perform some kind of maintenance to clean up orphaned health mailboxes as well.